Dixie Brewing Co. | Beer Apprentice - Craft Beer News, Reviews, Interviews and Info. Category Archives: Dixie Brewing Co.
For today’s craft beer review I’m going to be sipping on a Dixie Blackened Voodoo Lager created by the Dixie Brewing Company located in New Orleans, Louisiana. I have never even heard of this brewery before and I just picked this bottle up on a whim, so I have absolutely no idea what to expect with this brew. I couldn’t find a company website, so I looked on ratebeer.com for a commercial description. Brewed for Dixie Brewing by Joseph Huber during the breweries renovation. Brewed in the EU as well. Hmm. Not much to go on there. The beer poured a very, very deep amber to ruby red color. It looked clear and it had a light tan, creamy, soft and smooth head gracing the top of the liquid. It was of good size and it had both decent retention and decent lacing. Not too bad on the appearance I must say. The nose began with a distinctive burnt and toasted grain fragrance. Dark wheat bread notes mixed with some sour dough. Hints of sweet caramel combined with some earthy hops and a slight nuttiness completed a fairly well balanced and somewhat pleasant nose. The taste brought forth a tremendous amount of the roasted grains. It was very earthy with an almond undertone. It was just a little bit buttery in the taste, but it did reveal a little more of that sugary, sweet caramel that was found in the aroma. Again, more breadiness was discerned to create a mostly “round” taste. It’s ok. The mouthfeel was medium to medium/thin bodied. It was smooth, crisp, mostly dry and somewhat refreshing. The palate was not left with much flavor after the swallow, but that was ok, I’m not sure it was intended to completely drench the palate anyway. This brew was ok I guess. I have never been a huge fan of this style of beer in the first place, but it was enjoyable enough. It was very easy to drink and would make for a pretty good session brew. I don’t know that I would seek this out or that I would even try it again, but if you happen upon it, I don’t think it would hurt to give it a test run. I may see if I can find a few more efforts from Dixie Brewing Company and see if I can find one that I truly like. 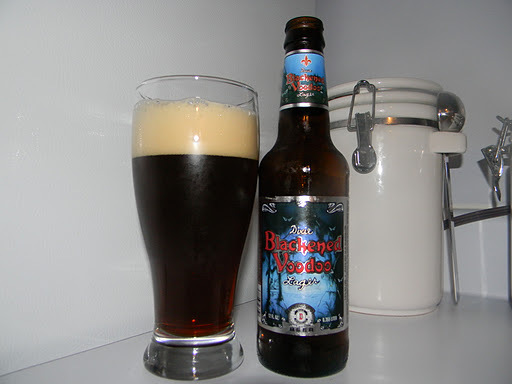 Have any of you guys ever tried the Blackened Voodoo Lager? If so, what did you think of it? Feel free to leave a comment and let me know. Posted by Beer Apprentice on November 27, 2011 in Country: USA, Dixie Brewing Co.